Stops smoke and heat spread by adapting to every entrance size. Easy and fast to install: A system of pliers with an integrated trigger allows the implementation in less than 20 seconds. Allows firefighters to open doors and enter as a team while keeping escape routes and the rest of the building free of smoke and toxic fumes. 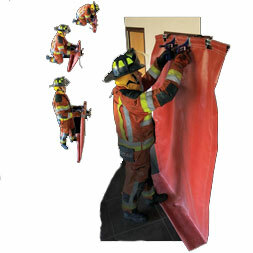 Allows firefighters to block off the opening of a burned or removed door or window. Also enhances PPV operation: PPV efficiency is increased by 10 to 15% by blocking off the top 3 ft (90 cm) of the door opening using the LEADER block.